I have another card for you today! I rarely ever participate in the colors challenges on splitcoast stampers and I think it's because I have it set in my mind that I'm really not good at them so today I decided to give it a try. The colors for this week's challenge were: White, Crumb Cake, and Calypso Coral. I used a retired Stampin' Up! stamp set called branch and I stamped the tree using crumb cake and the leaves of the tree are stamped using calypso coral ink, but I ended up stamping off with some of the ink- that gives it different shades of the same color ink. 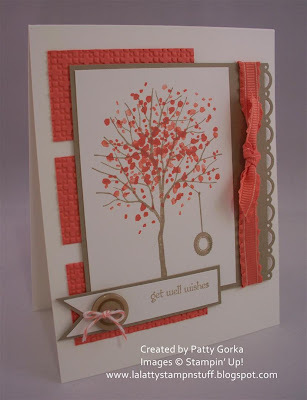 My background calypso coral card stock was dry embossed using my big shot and square lattice embossing folder. The right side of my crumb cake card stock was punched using my scallop trim border punch and I added a few white dots using my white get pen. My sentiment panel was stamped and then I notched out the ends using a 1" square punch. I added a button with some calypso coral twine tied through the center and this layer was placed onto my card using dimensionals. This is one of my favorite retired stamp sets! I hope you liked my card! See you tomorrow! Beautiful! I think you did great w/ these colors. 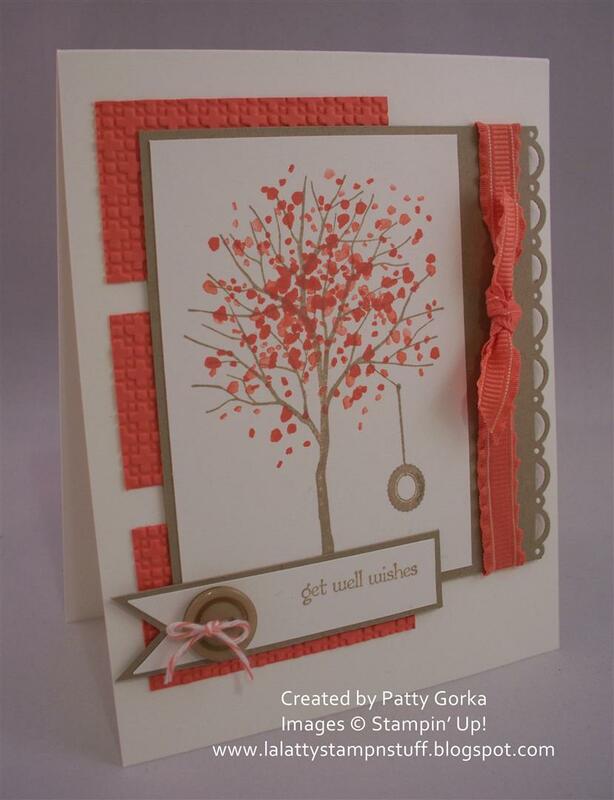 Wow Patty.....gorgeous card!!! I love the color combo. Beautiful! I used to love the color challenges and haven't played along in quite awhile. Maybe it's time to do a few. You and I are neck and neck in the 100 cards (not that it's a race, just nice to have someone moving along at the same pace).